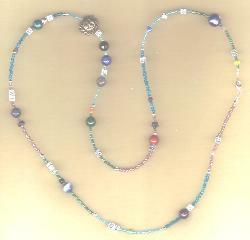 you always know what each bead signifies and why it's there. details for each individual separately as well as their combined union. Tell me the name(s) of the recipient(s). I need this for the companion book(s). recipient birthdate or event. If you don't know the exact time, can you get it? on that particular day. See our sample of how this works, it's a terrific solution! ☼ We have 36 available right now. we'll try to get it for you. necklace or strand is $10, or $15 for two necklaces or strands. will be on a case-by-case basis. address, your driver's license number, and your phone number. Or use the Order Forms on this website which include PayPal Shopping Cart buttons. Or call 860-872-3106 to place an order with a live human being, me!